Really incredible trip you had. I'm in Central Illinois and I'm sure you weren't but an hour from me looking for your last targets. Let me know if you come through Peoria area anytime. I'm happy to give a small tour. Above all I think it's great you give the hallowed ground the profound respect you have. Cool post. Awesome, I'm guilty of not coming back too often. I don't have a good reason. This site has given me so much joy. Your post was the first one I've looked at in a long time. Same as the old days. Just incredible pics and story. I need to get down that way. I've seen most on Facebook or Flickr but it's just plain silly to see them all together. Wow, you're pretty amazing. Thanks for the visual feast. Topic: From your neck of the woods. Caution...Lamp heavy. Re: From your neck of the woods. Caution...Lamp heavy. This was arguably my best find and my best shot. 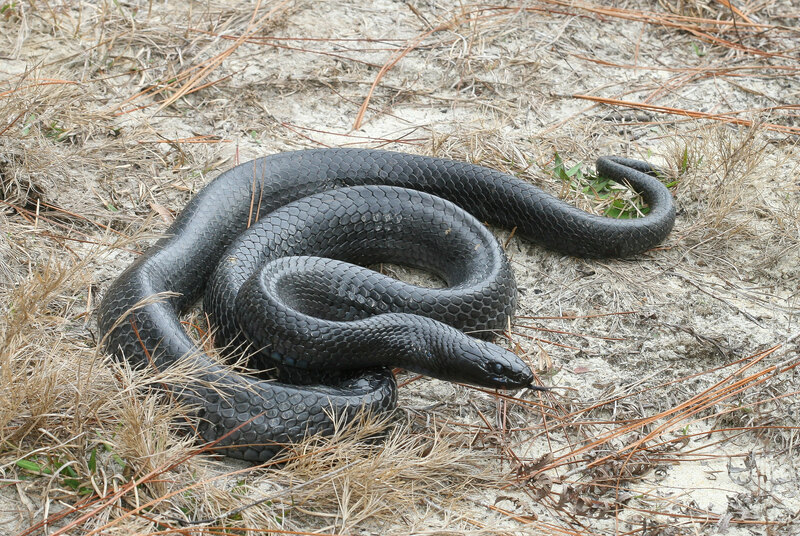 A gravid female Eastern Indigo, 6' plus and gravid. Topic: Lamps (yawn) from your neck of the woods. Re: Lamps (yawn) from your neck of the woods. These are all very cool. The art might/is my favorite part of the post though. You're amazing I've admired your work for a long time. Epic, that's just plain amazing. Great stuff Kyle. Please put RFI in the title. Request For Information, then the people who might be able to help will understand it's a request. Stunning photography, I will review this a time or two more. Amazing finds! Well done thanks for putting the post together. Topic: Mummified Frog In Box Of Pasta. Buon Gusto! Re: Mummified Frog In Box Of Pasta. Buon Gusto! A. americanus. The spikes on the thighs are the key identifier. Very cool post, I'm guessing there's a lot more to come. Is it me or does Daniel Dye get out with literally everyone? I love the Dyes, they're great people. Keep on herpin' man, I can't wait to see the rest of this mess. Topic: Australian Frog Research '15 - Long and Pic Intensive! Re: Australian Frog Research '15 - Long and Pic Intensive! JP you're killing it! Keep up the good work and share some of this stuff more often. The Echidna might have been my favorite thing. The Zigzag was from Southern Illinois. There's geographic ranges for those and redbacks, even though they look the same. Thanks for the kind words. Thanks for the cool post. I loved it. I am feeling the pull lately for the Tropics, this was super fun. So I breed a few hundred mice a year. To start I always recommend getting young males, not sexually mature. If you do this you can almost guarantee the females will grow to accept the males, to a degree. I use pine pellets and pine chips on top to keep the smell down. thanks for trying I know we talked about how hard it is to do a nice post on FHF compared to other online venues. I appreciate it nonetheless. Don't give up. Tight lines to you. You have some amazing pictures of snakes that I would love to see. Do you have an assistant keeping you safe during the shoots? Topic: Second Gaboon of 2015! Re: Second Gaboon of 2015! Congratulations that's a very exciting find! Topic: How About a Little Trip Down Snake Road? Re: How Abpout a Little Trip Down Snake Road? You run around with Dylan Kelly? LOL he's a great guy. Awesome post really cool finds and wonderful photography. Topic: One of the most awesome frogs IMO! Re: One of the most awesome frogs IMO! Ch'ien Lee is one of my favorite photographers. That's so awesome that you know him. I'm slightly jealous. This was a great post! The photos and story were just what I needed today. I need to get around to posting some things from this year as well I guess. Keep up the good work I'm sure it wasn't easy herping up that far North. Are they really such prolific burrowers? Do you start the burrow for them? Are you able to keep them out all year long? This is very impressive, well done. The pictures are each very good on their own. I really want to keep Sulcatas but won't until I'm prepared for them year round. I fostered one recently while it was warm enough out, but I don't have winter storage/space. I'm so sad I don't have that Sulcata now. You are doing it. You're doing what needs to be done to change minds! Keep up the great work, I'm thoroughly impressed and would love to see updates on your work. Tim Borski wrote: Cole Grover, Natalie McNear and Brian Hinds come to mind also. Anybody else have another member here they'd like to meet down the road at some point? I agree with these suggestions and Kelly MC, but there's so many of you I admire. Are these rare or Hubbscommon? Can anyone expound on the issue? I would like to finally meet Kyle Loucks, Tim Borski, and Dell Despain.